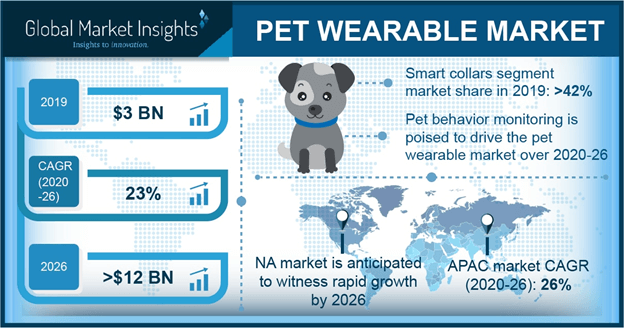 Pet Wearable Market size was over USD 1 billion and shipments exceeded 5 million units in 2016, industry growth is pegged at over 20% CAGR estimation from 2017 to 2024. Growing adoption of dogs and cats in several households in the U.S. is expected to drive the pet wearable market demand over the forecast timeframe. As pets are becoming an important part of the family, pet owners are investing more in wearable devices which are focused in monitoring their health and fitness. The devices enable monitoring of heart-rate, tracking & surveillance, and sleep patterns and may feature virtual boundary alert systems and geofencing capability to notify owners of their pet’s security. Factors such as power consumption and short battery life are expected to hinder the market growth. The devices operate on GPS and wireless networks and consume high power which may challenge the adoption to some extent. Additionally, lack of awareness amongst pet owners regarding the benefits such as fitness and health monitoring is anticipated to hinder the industry penetration. The RFID technology dominated the pet wearable market in 2016. The rising trend of adopting RFID tags for pet and livestock tracking is a key factor which is driving the RFID demand. These devices are designed for low and ultra-high frequencies. The vital applications for RFID are in animal tracking, and recording constant readings of daily activities. A key trend in the market is the increasing implementation of digital maps. Mobile applications developed with in-built digital maps help in tracking the location of the pets by retrieving the data sent from the tracker devices. Growing demand for real-time positioning, and safety & security, coupled with the rise in penetration of GPS enabled smartphone devices is projected to encourage the demand. Smart collar market size accounted for majority of the global revenue in 2016, as these products coupled with advanced mobile apps are helping track and monitor the pet’s health status and activities at regular intervals during the day. Rising awareness concerning the smart wearable technology coupled with the methods to interpret information offered by mobile applications and software platforms is projected to fuel the demand for smart collars. Moreover, high demand and increased adoption for smart collars can be attributed to their features which maintain an accurate location history and help trigger smartphone notifications. The commercial pet wearable market is expected to witness high growth in the coming years. Most wearable devices for horses and livestock are used to identify animals and monitor their health conditions. Several companies have developed products for the commercial end-user segment with GPS tracking capability. These devices are offering full range of integrated GPS equipment’s for horses as well as livestock and are helping monitor predator activity, health conditions and creating invisible fences which help limit the range of livestock. Identification & tracking applications accounted for more than 40% of the overall pet wearable market share in 2016. The demand for wearables in this application has mainly been coming from pets and dairy animals. RFID devices are aiding in safeguarding and managing pets and livestock, while certifying reliable RFID tracking performance and animal identification. Developments in smart devices featuring instant tracking through mapping applications is also projected to play a key role in the rising industry penetration. The U.S. pet wearable market is expected to grow at over 25% CAGR, owing to the high demand across the residential sector to track and monitor their pet’s day to day activities. Moreover, presence of several manufacturers offering advanced solutions and suitable wireless infrastructure will contribute towards the rising demand. In 2017, over 68% of the U.S. households owned a pet according to American Pet Products Association (APPA). The presence of over 94 million cats and 89 million dogs in the U.S. is driving the market growth across the region. The industry players include Tagg, Dropcam (Nest), Whistle Labs Inc., i4c Innovations, FitBark, Garmin, High Tech Pet Products, Invisible Fence, Ridogulous Labs, Motorola, Dairymaster, DeLaval, Inc., Otto Petcare, PetPace, Silent Herdsman Limited, Nedap, Loc8tor, Pet Vu Inc., and IceRobotics, etc. Due to the existence of several industry players and SMEs, companies are concentrating on acquiring smaller players and are investing in R&D to develop innovative products. 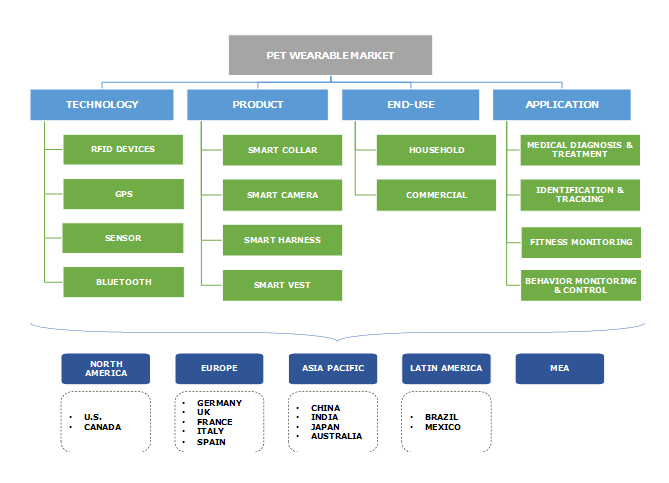 The pet wearable market is in the nascent stage and is highly fragmented in nature. The players are mainly focusing on expanding their product portfolio and features. Service providers and manufacturers are striving to improve and differentiate the design and engineering of their mobile applications and websites with the growing competition among location and tracking platforms. Over the forecast timespan, the number of manufacturers are anticipated to rise to more than 500 as the industry value increases.